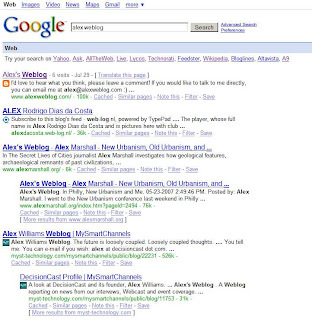 Alex's Weblog: Happy Birthday Alex's Weblog! So today is the first birthday of Alex's Weblog. (If you're curious, this is my first post exactly one year ago). What did this weblog accomplish in this past year? Hmmm actually I'm not so sure. The main reason for me to start this weblog is to share my thoughts with others. If someone feels that s/he gains something (whether it's a new idea, perspective, knowledge, etc), I consider that I've met my goal. I guess one little accomplishment of this weblog is that I've some regular readers now (Thanks to 冬冬, Yun, HanaMaru, Eileen, Tina, Fung. Sorry if I miss you since I only know the names of the people who left comments here...). Shall I continue blogging? Yes, I really want to. I really like blogging and sharing my thoughts with the world. It's especially rewarding when I realize that some people would agree with my weird thoughts so that I know I'm not that weird after all. That said, I probably won't post as frequently as before. Life's filled with too many responsibilities and priorities and you just have to take care of those before you can enjoy yourself. I really hope that one day I can blog whatever I want, play some more piano, read more interesting books/blogs, travel to more places, and, help some people who're in need and deserve them.